Fortunately, there are a number of easy ways to make your home more eco-friendly - and save big on your monthly utility bills - one of which being to upgrade to more energy efficient home appliances. While it’s always best to repair your appliance, rather than replace it, if one of your home appliances is at least 20 years old, now would be a great time to upgrade to an energy efficient version, ideally one that’s ENERGY STAR® certified. The ENERGY STAR® certified appliances listed below are 9-25% more energy efficient than the minimum federal efficiency standard, meaning they’ll cause less harm and waste to both the environment and your wallet in the long run. We’ve compiled this guide on some of the top energy efficient appliances to choose from, almost all of which are ENERGY STAR® certified and manufactured by trusted brands household brands you know and love. Without further ado, here are some of the best energy efficient appliances 2019 has to offer. At the top of our list is this 29 cu. ft. Side-by-Side Food ShowCase Refrigerator with Metal Cooling from Samsung. This sleek, stainless steel fridge not only looks great, but it’s ENERGY STAR® certified and incredibly sustainable. ENERGY STAR® certified fridges are about 9% more energy efficient than other models, and this fridge not only meets requirements, it exceeds them. 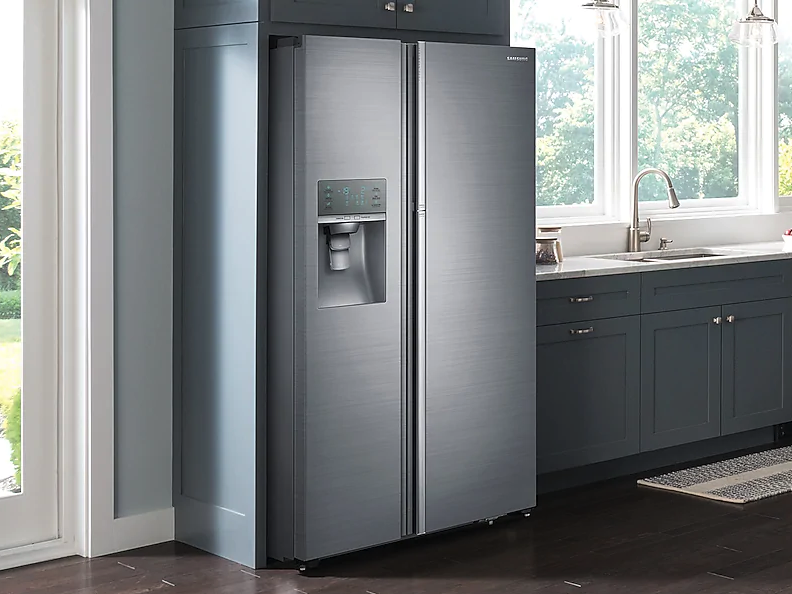 With high-efficiency LED lighting, Metal Cooling locks and stainless steel paneling to lock in temperature, you can rest easy, knowing that you’re doing your part to minimize waste at home, while enjoying a luxurious, top-of-the-line fridge. 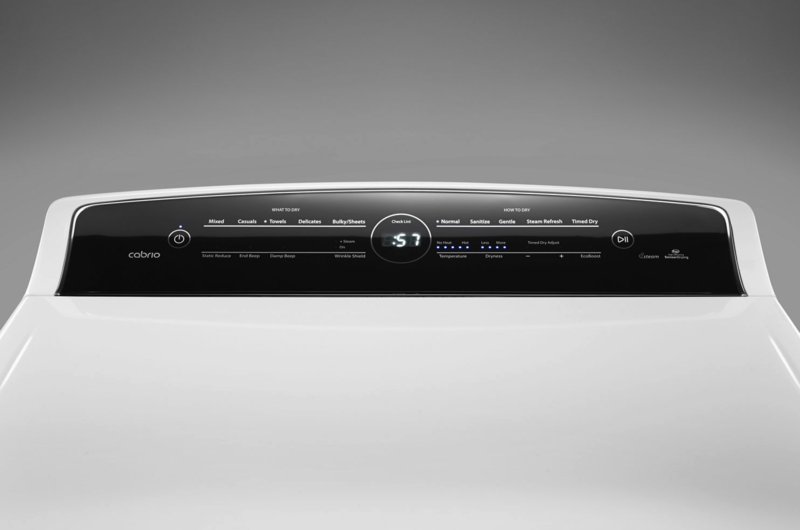 Another great eco-friendly appliance we’d recommend the GE® Dishwasher with Hidden Controls. 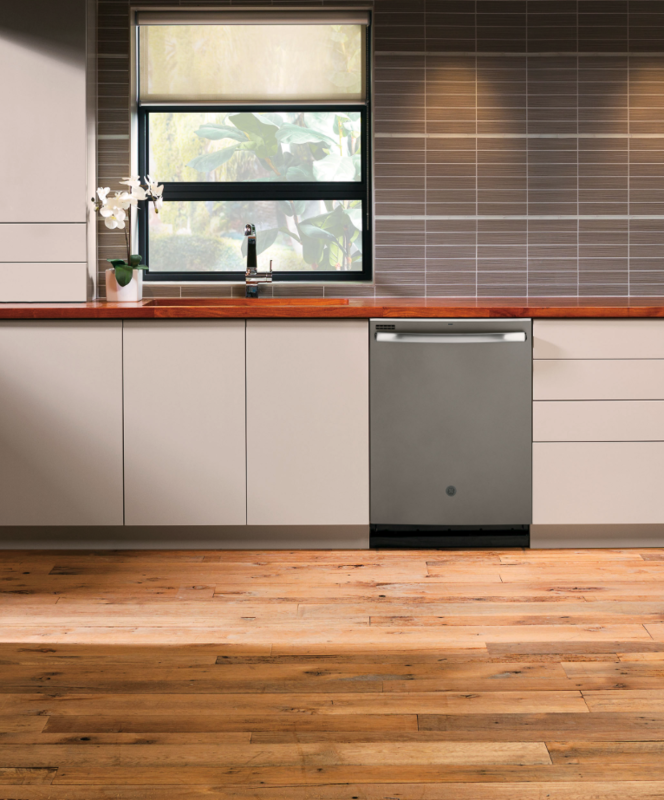 In addition to its stylish finish, this dishwasher is ENERGY STAR® certified, meaning it’s about 12% more energy efficient than the average dishwasher. Plus, with its ultra-powerful 600 Series wash system, a quick, 1-hour wash cycle, and half-load wash options, it packs a lot of power while saving you energy and money. You can even connect it to Alexa or your Google Assistant for real-time updates, alerts and more. Typically a whopping 25% more energy efficient than the average washing machine, ENERGY STAR® certified washing machines are not only an incredible way to reduce your environmental emissions, they’ll also save you a significant amount on your water bill. We’d recommend Maytag's ENERGY STAR® certified Front Load Washer With Steam For Stains Option and PowerWash® System. This top-rated, stainless steel appliance is backed by a 10-year warranty, has a renowned Cold Wash option, and even has a convenient Rapid Wash cycle, that’ll help save you major time - in addition to all the money and environmental waste you’ll be saving. Up there with washing machines, ENERGY STAR® certified dryers are about 20% more energy efficient than conventional dryers - not too shabby. 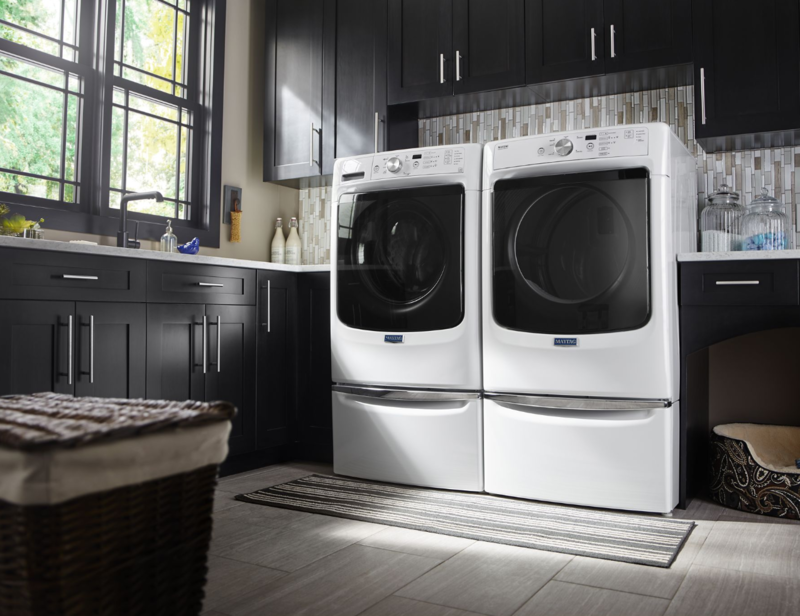 We’re big fans of this ENERGY STAR® certified Top Load HE Electric Dryer with Intuitive Touch Controls from Whirlpool. Why? Its state-of-the-art Advanced Moisture Sensing technology can sense the needs of each load, adjusting times accordingly, so it stops automatically, the minute your clothes are dry. This way, you’ll significantly reduce drying time, and avoid inaccurate, wasteful drying cycles. If that’s not enough, it can even help reduce wrinkles and odors as it dries, to keep your clothes in top condition for much longer. 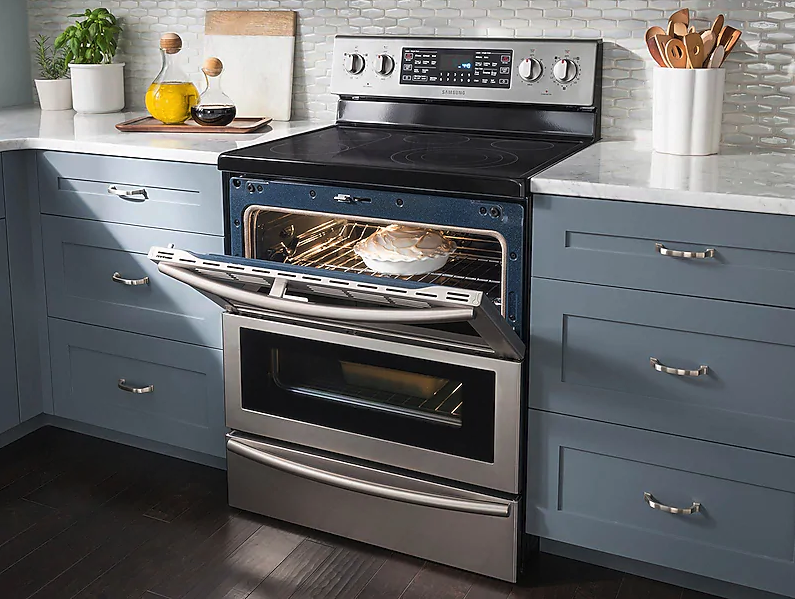 Unfortunately, there is no list of ENERGY STAR® certified household ovens, only a list of commercial ovens, which are primarily used in the restaurant industry. That being said, a safe bet for reducing your environmental impact at home would be to go for a dual door range, like this 5.9 cu. ft. Electric Flex Duo™ Range with Soft Close and Dual Door™ from Samsung. Having two separate oven compartment allows you to open just the top section, so you won’t need to heat up the whole, large oven, just to bake something small. This model’s door is middle-hinged, so you can adjust to your specific cooking needs, and significantly reduce your emissions and reduce your monthly utility bills. Whether you need help installing a new eco-friendly appliance, or repairing an existing one, Puls has you covered. Our skilled appliance experts will work around your busy schedule, to diagnose, repair, or install any appliance you need. With appointments available as soon as same-day, technicians in your area with years of experience, and a 90-day guarantee on all parts and labor, you really can’t go wrong. Click here to install a new appliance, or click here to have us come diagnose and fix an existing one. Plus, for a limited time only, you can enjoy $20 off all services when you book online with the code: SAVE20. For all your appliance needs, Puls is here to make it easy. There’s no time like the present to transform your space into an energy efficient home, to start saving resources and some serious cash for years to come.